Android Thoughts: DoublePlay Says Why Not Have Two Screens? DoublePlay Says Why Not Have Two Screens? "T-Mobile and LG have announced the LG DoublePlay, an exclusive addition to the T-Mobile lineup featuring dual-touch screens powered by T-Mobile's 4G network. The DoublePlay is the 'ultimate multitasking handset with dual touch-screens, allowing users to simultaneously email, text, surf the web, check in on various social networks and more.'" An extremely interesting looking device coming to T-Mobile soon. 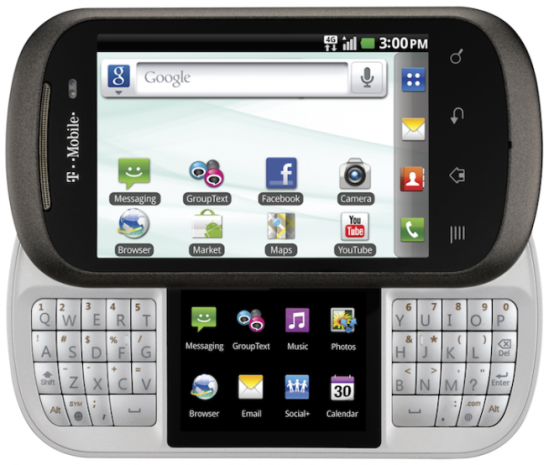 LG provides this dual-screened Android device featuring a split keyboard. While it looks sorta strange, I can think of some pretty cool applications for that second screen, hopefully developers would be able to access it easily!